So, I’ve grown carnivorous plants for a while now. In the next year, I’m going to pass two milestones that are hard to believe: over a decade in the hobby, and over half my life in the hobby (I know, I’m a young’n). I’ve accumulated a stupid amount of knowledge about them in that time. You could name just about any species of carnivorous plant, and I could tell you the general area they’re from, basic cultivation conditions, propagation info, if it’s in cultivation, and some interesting things about the group it’s in. I like a lot of things about this hobby — it’s pretty straightforward, the plants are beautiful and (often) easy to propagate, there are interesting things about every species, and other growers are often really generous and kind. While many rare species can be horribly expensive, it’s fairly inexpensive to get started in the hobby. Heck, many growers (including myself) giveaway free plants, cuttings, or seeds from time to time. 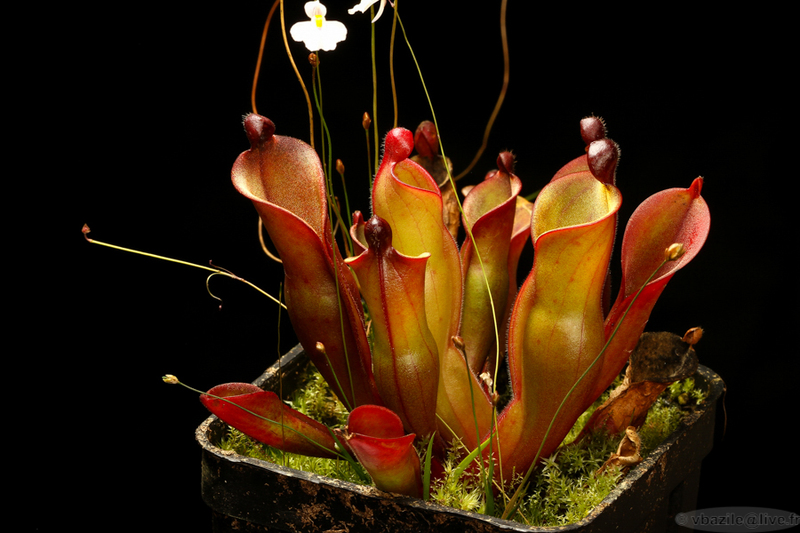 Unfortunately, most of carnivorous plants grow in threatened habitats. Just here in the US, we’ve probably destroyed 90% or more of the carnivorous plant habitat there is. To make matters worse, while some of their remaining habitat isn’t directly being destroyed, other factors like lack of burns, invasive species, and poaching are huge threats — even in “protected” habitats. Does anybody else here grow them or have any interest in them? If you’ve got any questions about carnivorous plants, feel free to ask away! We have a pitcher plant and a sundew at home. They both seem to be doing well. We can't really see any bugs in the pitcher plant but the sundew has a bunch. They also self pollinate — just this year, I’ve probably harvested in excess of 10,000 sundew seeds (that’s not a typo). If you want more of your sundew, you can take leaf cuttings. Basically, you cut off a leaf and float it in distilled water in fairly bright light. It’ll probably grow a little plantlet, which can be potted up and grown like the adult. They can be a bit tricky to care for. I do think a lot of people originally get interested in them in middle/elementary school. It just doesn’t stick for most. That’s when I got interested — I had to research the rainforest, and came across a picture of a Nepenthes. I’ve been hooked ever since. I got a Venus fly trap when I was a kid. Instructions said to water it every two days and keep it in sunlight, so that's what I did. I caught a fly and fed it to the plant. Watched in amusement as the fly struggled and failed to escape. Buuut a few days later that leaf or whatever it's called turned black and died. So I dunno what I did wrong. 100% honest questions here, as I'd love some sort of insect devouring plant in my backyard. 1. How would they fair in the outdoor environments of Central Kentucky/Southern Indiana specifically the Louisville area? Would they need to be permanently potted and moved indoors for the winter or would the root system stay alive while the top green bits freezes off? Potted in fall but placed back in the ground in spring? Indoor only? 2. Do you know if goats like to eat them? 1. There's a lot of carnivores that could grow well outside in that climate. 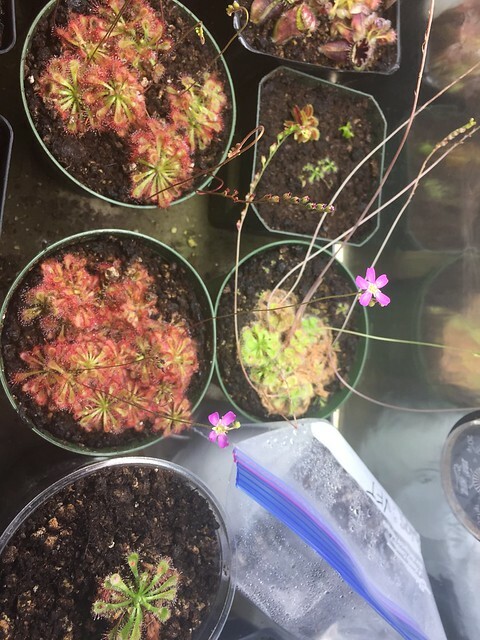 Drosera filiformis and D. intermedia are the two sundews I'd recommend for there -- they are both extremely hardy and pretty common in cultivation. You're right on the border for growing a lot of the southeastern carnivores. The northern form of Sarracenia purpurea should do well there, and if you're willing to provide a bit of protection in the coldest part of winter, most of the other species and hybrids in that genus should do well too. I'd recommend S. flava -- it's quite cold hardy and can be absolutely stunning. All these plants would need to be grown in pots -- they only grow in basically nutrient free soil (I use a 50:50 mix of peat and perlite) and need water without many dissolved solids. You could probably grow venus fly traps too, but they'd require more substantial protection in the winter. If you're looking for indoor plants, D. capensis is the #1 plant for beginners -- it's very fast growing and nearly impossible to kill. It needs brighter light than most houseplants, but can get by with quite a bit less than some other carnivores. I've heard that Mexican butterworts are also good for beginners and do well indoors, but I don't have experience growing them. The standard way of growing most carnivores is the "tray method". You sit the pot in a tray of distilled, RO, deionized, rain, or other water with low TDS. I like to let the trays dry out and sit for a day or two before filling them again, but others keep them permanently flooded. However you do it, you can't let them get dry -- they mostly grow in bogs. They mostly like a lot of light. I'd say the biggest reason they die is because people don't give them enough sun. My outdoor plants enjoy full, hot, unfiltered TX sun from about 10:00 to about 6:00. They could probably even get more. My indoor ones are 6-8" under a 4 bulb T5HO fixture that's on 16 hours a day. 2. I don't really have any idea if they'll be eaten. Deer have never bothered mine (much -- I grown mine in a fenced area now just in case), but goats seem more adventurous than deer to me! teelo wrote: I got a Venus fly trap when I was a kid. Instructions said to water it every two days and keep it in sunlight, so that's what I did. I caught a fly and fed it to the plant. Watched in amusement as the fly struggled and failed to escape. Buuut a few days later that leaf or whatever it's called turned black and died. So I dunno what I did wrong. If I remember correctly, each snappy dude can only snap so many times, and then it dies. This is why it's bad to poke them. Also why they grow as a group of snappy dudes. Yep. Rapid cell growth is part of the closing process, and that can only happen so many times. It’s not bad to poke them, but it means that trap will die sooner. The reason they grow as a group is because the traps are highly modified leaves (the “leaf” looking part is actually the petiole) — imagine something like a dandelion with the leaves replaced by traps (that’s how they grow). They evolved from plants with multiple leaves, so they themselves have multiple leaves. Now I think I need some kind of pitcher plant for my kitchen! pogrmman wrote: 2. I don't really have any idea if they'll be eaten. Deer have never bothered mine (much -- I grown mine in a fenced area now just in case), but goats seem more adventurous than deer to me! Appreciate the information, I'll look in to getting some of those and if I get any, I'll let you know about #2. She thinks she's a dog. PAstrychef wrote: Now I think I need some kind of pitcher plant for my kitchen! For that, one of the beginner Nepenthes (like N. x ventrana or N. ‘Miranda’) is probably your best bet. Most of the other pitcher plants (Sarracenia, Darlingtonia, Cephalotus, and Heliamphora) require way more light than what you generally get in a kitchen. They’re a bit trickier than the average houseplant — they need more light especially — but lots of people grow them inside successfully without doing anything fancy. SecondTalon wrote: Appreciate the information, I'll look in to getting some of those and if I get any, I'll let you know about #2. If you’ve got any more questions, feel free to ask me. There’s also some really good forums for carnivorous plants — terraforums and FlyTrapCare are good (though there are others). Cute goat! My kitchen has big windows and two skylights and glass doors. It gets more light than any other room in the house. Do you have recommendations for where to obtain the plants? PAstrychef wrote: My kitchen has big windows and two skylights and glass doors. It gets more light than any other room in the house. Do you have recommendations for where to obtain the plants? That sounds like it would be a great place for beginner Nepenthes. In addition to the ones I already mentioned N. ventricosa could be a good choice (and it’s readily available). You can get that one from most of the carnivore nurseries — California Carnivores and Sarracenia Northwest are both good options that should carry that species (though a bit pricier than some others). N. x ventrata and N. ‘Miranda’ both sometimes show up in local nurseries and even Home Depot or Lowe’s. I’ve seen them at all of the above. That’s where most people get theirs from. Both of these plants are carried by some of the big distributors. Some of the specialist carnivorous plant nurseries carry them on occasion, and you might be able to get them from an individual hobbyist. While I’ve never ordered Nepenthes from them (only Sarracenia) PetFlyTrap has N. ‘Miranda’ in stock. I’ve never ordered from these guys, but they have it too. Those two are pretty common in cultivation, so you should be able to find them in a few places. They’re easy to grow, so it should be in good shape, just about wherever you get them.